Shirts With Random Triangles: A.J. McCarron meets Forrest Gump (sort of). A.J. McCarron meets Forrest Gump (sort of). A.J. McCarron with "Forrest Gump." Via Katherine Webb on Instagram. Two of the most famous players in Alabama history sat down for a photo over the weekend in Los Angeles. Actually, one was already sitting down because he was just a wax stature. Not to mention being a fictional character. Former Alabama and current Cincinnati Bengals quarterback A.J. McCarron visited Madam Tussauds Hollywood wax museum along with fiance Katherine Webb, who shared their trip on Instagram. While Webb got her picture taken with a wax statue of Tiger Woods (oh, the places I'd go with that one! 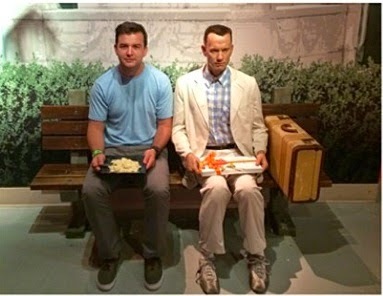 ), McCarron sat down with the wax representation of Tom Hanks in arguably his most famous role, Forrest Gump. The visit to Madame Tussauds happened while McCarron was in Los Angeles taking part in the NFL Players Association Rookie Premiere.